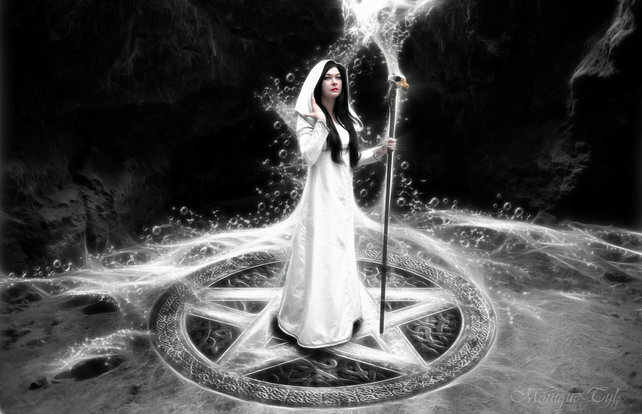 Have you tried to cast a Magick Circle yet? Do you understand why you're casting a Circle? The Circle is there to protect you, and is the MOST important thing you can learn when undertaking the path of Wicca. The reason for doing this is simply one of precaution. Metaphysical energy attracts a certain amount of attention from beings of a spiritual nature. Just as you wouldn’t leave the front door of your house open to anyone who happened by, you likewise need to close supernatural doors. This is done by Casting a Circle and calling the Watchtowers. White light is considered symbolic of pure protective energy. To begin, sit quietly with your eyes closed, imagining a white light surrounding first you, and then the area where you are working. It is easiest to envision this light as coming from above you as sunlight does. As you see it clearer in your mind, allow the light to grow brighter, you may begin to feel warmer and the room may see quieter or different than when you began. This indicates that you have done it correctly. After you have protected your sacred area, you can then move on to actually casting the Circle and calling the Watchtowers. The Circle is forever retuning to itself, symbolic of our soul’s passage from birth, life and death to rebirth. We know that energy cannot be created or destroyed, but simply changes form so it is for our soul, which is our spiritual energy. The Four Quarters or Watchtowers each have guardians, which are comparable to angelic beings that are welcomed into your sacred space to protect, bless and witness your workings. In Wicca North represents the element of Earth, midnight, winter and the sense of touch and the angelic spirit of Gabriel. South is the balance of the North being fire, noon, summer, energy and the sense of sight guarded by the angel Ariel. East is the place of dawn, spring, any magic dealing with the mental or our sense of smell, something that is carried on the winds, and the angelic being Michael. West is water, emotions, intuition, twilight, fall, the sense of taste, and the angel Raphael. These four points are set up to represent the outer barrier of your magical space, to protect it and help establish a special energy area in which magick can be built. Each one of these elements is called and welcomed into the sacred space by the invocation, sometimes specifically by name, and other times by a general greeting.